I should begin this by stating that there WILL be spoilers within this review. Therefore, if you intend on seeing it and/or would rather not have the film revealed to you as of right now, please do not read on. Otherwise, I hope you all enjoy this post. There are two words I would use to describe this film: moving and beautiful. Many might say that death is a huge topic in this one, but I would rather think that life is the main topic, and that in order to live life to the fullest, we must take advantage of every opportunity we have to spend time with our loved ones. To tell them how much we care about them while we have the chance. The film opens with a couple named Cindy and Jim Green seated with two members of an adoption agency. They claim how their only experience with a child is “Timothy.” The agency gives the couple a limited amount of time to explain who Timothy is. Therefore, the remainder of the film is a flash back of sorts. They begin by saying that Cindy is unable to have a child. Upon finding out this information, they make a list of traits they would have wanted their child to have. They place these notes in a wooden box and bury the box in their backyard. Overnight, they have a heavy rain storm/thunder storm. Jim and Cindy hear strange noises so they head downstairs to check it out. After much searching and exploring, they finally discover a young boy in a room of their house, covered in dirt. Cindy gives him a bath, and sees that his legs are covered in leaves; she calls Jim in to see this, which gives us a comical exchange between the couple. Nothing is making sense at this point, but they quickly figure out where he came from. They decide to keep knee socks on Timothy, to avoid curious looks and judgment from others. From here, we meet Jim’s father and Cindy’s family. We also discover that, since Timothy’s life is a plant of sorts, he receives his nourishment from the sun. This is one of my favorite things about the film. When the sun comes out, he stands facing it, and spreads his arms wide open to absorb the light and warmth. He meets a girl at his school named Joni, who seems to understand his differences. They form a bond and become very close. Timothy is just about the sweetest kid you will ever meet. His persistence is contagious, as is his smile. The scenes throughout this film are endearing, especially one which takes place at Cindy’s sister’s house. Her family puts on a concert, and invites Timothy to play an instrument on his own. The scene which follows is smile worthy, and truly sweet. There are also many serious moments in the film, such as threats of Jim’s pencil factory going out of business. Timothy comes up with an idea to make pencils out of leaves. Jim pitches the idea to his boss, Mr. Crudstaff, who seems unimpressed. Meanwhile, every day Cindy becomes more and more disgusted by her insensitive boss, Ms. Crudstaff. Cindy brings Timothy in one day, and he offers to draw a portrait of said boss. Well, being the straightforward and honest young man that he is, he includes a physical trait in the picture that most likely should have been ignored. This results in Cindy lashing out at an insulted Ms. Crudstaff, which results in her termination. Sadly, as the saying goes, all good things must come to an end. Just like a small tree, Timothy’s leaves are falling off one by one. This happens throughout the duration of the film. He realizes upon having one remaining leaf, that this is the time he needs to inform both Joni and his parents. We do not see the exchange which takes place between the two, but we see Joni crying as she and Timothy hug. Shortly after, they arrive home, where another storm is taking place. He tells them they have to get inside, where he informs his newfound parents, Cindy and Jim, that he has to leave. Folks, this is where you are going to need that box of tissues by your side. They all begin to cry and form a group hug, as Timothy tells them that they are ready to become parents. He knows the trials and tribulations they have been through, and knows in his heart that they have great parenting skills to raise a child. With a flash of lightning, Timothy disappears. Cindy and Jim run outside and re-discover the box in the dirt. This leaves us back at the adoption agency, where they inform the couple that they will be in touch. We hear Timothy’s voice as he explains what he did with each of his leaves that he saved (this leads to more tears, people). The last scene gives us the people from the adoption agency, as they arrive at the Green household and present them with a beautiful girl to call their own. This film was incredibly well cast. Cindy was played by Jennifer Garner, who has appeared in a number of films and television shows. She gave us the lead role in the show Alias, which lasted five years. Jim is played by Joel Edgerton, who gives us a…wait for it…Star Wars connection! He played Owen Lars in both 2002’s Attack of the Clones and 2005’s Revenge of the Sith. Timothy is CJ Adams, who has not had a lot of experience yet but I guarantee we will see him in much more in the coming years. Odeya Rush is the misunderstood Joni. Rush, similar to Adams, is not quite experienced in the acting world but is another actor we will be seeing more of in the future. We also have fabulous performances by Ron Livingston (Mr. Crudstaff), Dianne Wiest (Ms. Crudstaff), M. Emmet Walsh (Uncle Bub), and David Morse (Jim’s dad), among many others. This is directed by Peter Hedges, who also wrote the film’s screenplay alongside Ahmet Zappa. Hedges wrote Dan in Real Life (which CJ Adams was also cast in) as well as Pieces of April. He also wrote screenplays for 2002’s About a Boy, 1999’s A Map of the World, and 1993’s What’s Eating Gilbert Grape. The music throughout the film is wonderful, especially Glen Hansard’s “This Gift”, which has quickly become one of my new favorite songs. My favorite scene is at a work meeting of Jim’s (a scene which I did not mention that takes place toward the end…you will have to see for yourselves). My favorite character was, of course, Timothy. I love everything he represents. His aura is love and he is interested in everyone he meets. He wants to get to know them, and does not have a care in the world that they treat him with disrespect. He knows what he was put on this earth for, and he intends to live this out with good intentions. All in all, just about everything in this film is top notch. At times, the plot becomes a bit hurried but it is worth it to overlook in order to comprehend what Timothy represents for his new family and those around him. Also, thanks to Disney, his viewers are also powerfully impacted by who he is. 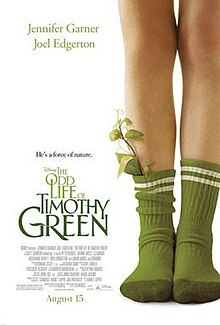 The Odd Life of Timothy Green has so many wonderful messages. First of all, the most important is that you should NEVER let a day go by without telling someone you love them because you do not know when you will lose them. In a flash, they could be gone. With the recent passing of our friend Nolan Woodall, many of us understand this point quite well. Also, do not go through your life judging others. God did not make us to be that way. It is His place to judge, and not ours. There is also a scene in the film which approaches the topic of bullying – instead of Timothy crying or fighting back, he lets the kids proceed without saying anything. When you take a step back and realize that some people are simply not understood and do not know the true definition of appreciation, you will learn a lot. Accept differences and treat others the way you would want to be treated. Accept people with open arms and understand their unique qualities. Everyone has a purpose on this earth, one which leads to us holding them in our hearts forever. Go forth and meet others. Appreciate them. Acknowledge their differences. And most of all, please love them. Did you know that I’m a big fan of your work?